BERKELEY HEIGHTS, NJ, September 25, 2018 /24-7PressRelease/ — Axtria, a global leader in software technology and data analytics for the Life Sciences industry, is proud to announce that it has been ranked 110th on the NJBIZ Top 250 Privately Held Companies 2018 list. 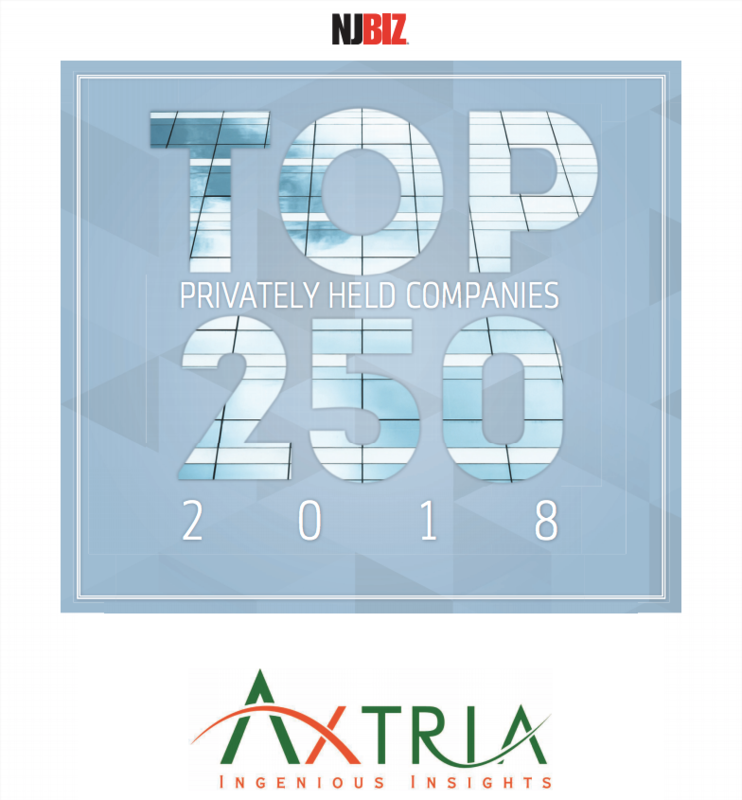 Axtria is among the top 5 fastest growing mid-size private companies in New Jersey and has been featured on this list for the past four years. New Jersey’s privately held companies act as a key indicator of business growth in New Jersey and showcases the largest private companies. The list, provided by New Jersey’s leading business journal (NJBIZ), evaluates companies based on revenue, growth, and employee count. Axtria is proud to be a consistent contributor to the success of New Jersey’s economic growth and stability. Axtria provides jobs to over 250 employees in New Jersey, which is part of Axtria’s nearly 1,000 employees across the globe. In addition, employees from the Berkeley Heights headquarters are actively engaged in several community services projects throughout the state. Founded in 2010, Axtria now serves over seventy-five clients in over thirty countries and has hit numerous revenue milestones with rapid year-over-year growth. Axtria’s consistent growth and innovation has been recognized by several leading industry associations with numerous product and growth awards. To learn more about Axtria and their solutions, please visit www.axtria.com. Axtria Sales IQ™, Axtria Marketing IQ™, and Axtria DataMax are cloud based software platforms that enable customers to manage data, leverage data science to deliver insights for sales and marketing planning and manage end-to-end commercial operations. Axtria, Axtria Sales IQ, and Axtria Marketing IQ are registered trademarks of Axtria. Other names may be trademarks of their respective owners.